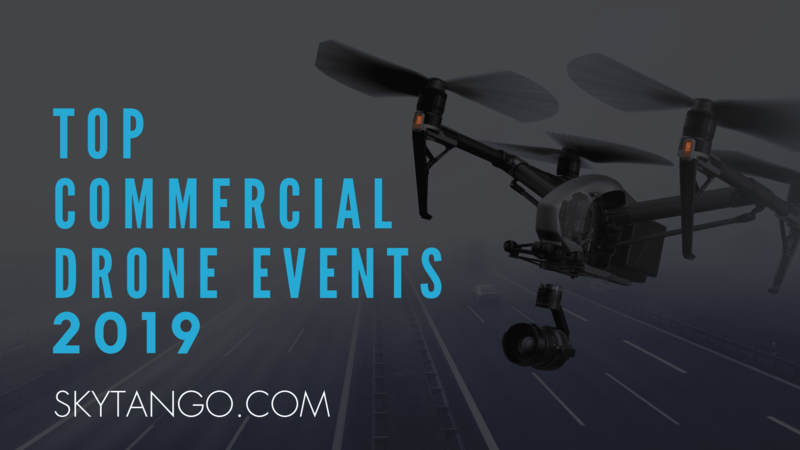 Check our 50+ list of the top commercial drone events of 2019. Which events will you visit this year to keep you updated on the latest technology, develop your professional network and increase your sales ? The commercial and civil UAV market is still booming even if at a slightly slower pace than originally predicted but new products and new applications are still emerging. 5+ years in and the first bloom of drones has faded and we are now looking at drone technology as another tool in the toolkit, focusing more on how they aid data acquisition. We have said goodbye to some early companies and have seen urban mobility rise. Now we are down to brass tacks – who’s left standing in 2019 and what are they doing? In this dynamic industry, how can you keep updated on the latest news, find partners and quickly develop your professional network? Attending the best commercial drone events will help you in several ways. Participating in high-quality UAV conferences, workshops or technical sessions is a quick and efficient way to learn about what’s going on in your sector and improve your business. If you participate in an international or national drone trade show, exhibition or fair as an exhibitor, you will get a platform to showcase your products to a premium audience, an opportunity to meet your target customers face-to-face, and a way to monitor what the competition is doing. Trade shows and exhibitions are also great marketing and sales channels, helping you build your brand, get leads and customers, and increase your overall sales. If you have specific expertise or an interesting business case, you could also attend an event as a speaker and build your reputation (and your brand’s reputation) as an expert within the industry. Most of the events listed below feature networking and matchmaking activities too: they will allow you to rapidly increase your professional network, and to find commercial partners or investors. Many events run pitch competitions for startups. A great way to get your name circulated and potentially get that much-needed cash injection. If you are interested in finding an investor for your startup, check their portfolios to make sure your interests are aligned. It will save you time in the long run. So, there are plenty of reasons to attend one or more commercial drone events in 2019 with April showing as the busiest month. But don’t worry – July is shaping up to be the ‘month off’. We have reviewed B2B drone events such as trade shows, expos, and conferences with national or international importance. We found that in 2013 there were 17 commercial drone events, which grew to 30 in 2014 and 60 in 2015. We counted over 90 commercial drone events organized in 2016 and over 100 in 2017. In 2019 the list has settled and some events have risen to the top. This year will see a culling, but there are still 50+ events to choose from. So, how will you choose which commercial drone expo you should attend to benefit you most and get your return on your investment? A number of events which ran in 2018 haven’t been confirmed yet for 2019 so we kept them in this list (flagging them as not confirmed yet). We have also seen some events merge. Some events have been deleted completely in the 2019 update. Scrolling down the page, you will find an overview for each drone event, including details on location, dates, costs, organizers, sponsors, focus etc. when the information is available to us. Who is organizing the event? Is it an industry body or an event company? Are they recognized in the industry and do they have the right connections? What is the focus of the event? Is it aimed at the drone sector in which you are involved? Who is the audience for the event? Is it more consumer or B2B oriented? Do buyers or sellers of drone technology attend? Look at the exhibitors. Are they of interest to you and your business? While every care has been taken to present accurate information – we’re only human! Let us know if we are missing an important commercial drone event from the list. If you have attended any and have something to say about it, let us know that too! CES is the world’s gathering place for the business of consumer technologies. It is a trade only event for 18+ yrs. The CES (Consumer Electronic Show) is much more than drones showcasing many complimentary technologies. However, the Consumer Electronics Show is – without any doubt – the world’s largest gathering of consumer electronics enthusiasts and businesses, with unmanned aircraft a formidable category in consumer electronics. The International Consumer Electronics Show in Las Vegas in 2015 dedicated an entire section of it exhibition floor, called the Unmanned Systems Marketplace to unmanned aircraft and similar remote-controlled or autonomous products. This section doubled in 2016 in space and exhibitors and 2019 sees 163+ exhibitors featuring drone technology. This year’s conference lends its focus to urban mobility and mapping the policy and business landscape. CES showcases more than 4,500 exhibiting companies, including manufacturers, developers, and suppliers of consumer technology hardware, content, technology delivery systems and more; a conference program with more than 250 conference sessions and more than 180K attendees from 150 countries. 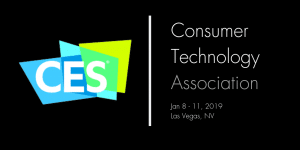 In addition to exhibits on the show floor, CES 2019 will feature conference sessions focused on drone technology. AMA is the largest U.S. organization dedicated to model aeronautics with 195,000+ members. AMA Expo West is their oldest model aviation show offering the latest products in radio-controlled model aviation, demonstrations, interactive displays, flight demos, technical sessions to thousands of attendees (5,000+ attendees in 2016, and 200+ exhibitors). While it’s not focused on drones and is more consumer than B2B, drones have been growing in popularity in the show and there have been quite a few drone-related sessions and showcases in the past. Cost (2019 event): Audience: starting from EUR 380 Both Days. On-site registration will NOT be possible. The Remotely Piloted Aircraft Systems Civil Operations (RPAS CivOps) is an international conference focusing on regulatory matters for civil RPAS operators, with a specific focus on the European markets. It’s organized by UVS International, in coordination with the European Parliament, European Commission, European RPAS Roadmap Implementation Coordination Group, International Civil Aviation Organization (ICAO), European Aviation Safety Agency (EASA), European Space Agency (ESA) and several other European and national government agencies. Cost (2019 event): From $2,000 9msq 10% Early Bird Discount available. Visitors are FREE if pre-registered. South Korea is one of the world’s leading countries in the UAV sphere with companies like Samsung, Hyundai Motors, SK, LG, Lotte, KAL (Hanjin) and Hanhwa active in the industry. The Drone Show Korea, organized by the Korea Unmanned Vehicle System Association, the main UAV trade association in South Korea, is a 2-day event first launched in 2016, and includes a main conference, technical sessions, an 8,800 square meters exhibition area (DJl, Hanwha Techwin, Korean Air, Uconsystem, Xiro, Yuneec were among the exhibitors) and an education and experience area. In 2016 the event hosted 24 speakers, growing to 50 speakers in 2018 when it attracted over 26,500 Participants, 344 Booths, 100 Companies, and over 1,400 conference attendees. DroneHack, hosted by the University of Central Lancashire’s (UCLan) Civic Drone Centre and Trinity Mirror, is a 1-day event bringing together journalists, editors, storytellers, newsrooms, coders, developers, and engineers to create innovative drone concepts for journalism. Participants to the event will design, test and fly drones that explore new ways to capture data and hear from a series of top-notch industry experts. Cost (2019 event): €120 (vat inclusive) before Feb 1, €150 after. CivilDRON is a 2-day event focused on civil applications of drones, running for the fourth year in Madrid, Spain. It features a technical congress and an exhibition area. Cost (2019 event): Exhibition Pass: Free, 1 x Day Conference Pass:€250, 2 x Day Conference Pass €450. Exhibitor: from €306 per sq. m / with early bird discounts available. The Unmanned Systems Expo (TUSExpo) is one of the most important B2B events in Europe dedicated to the UAV industry and this year is co-located with Infratech 2019. TUS Expo Europe is part of the 2nd International Robotics Week in Rotterdam. It provides a complete Exhibition and Conference addressing the what, why, and how of current and future of the Unmanned Systems industry. Prior and during the Exhibition and Conference, there will also be different Side Events. The 2-day TUS Expo includes a main conference hosting industry leaders, a trade exhibition, a networking/matchmaking programme, live demos, and specific sections and activities for universities and innovative drone startups. TUSExpo covers both commercial and civil applications for all types of industries including security, agriculture, industry, science, entertainment, environmental protection, logistics, construction, space, maritime and energy. In their inaugural event in 2015, TUSExpo attracted 1,500+ visitors from 69 countries and 180 conference attendees. It hosted 64 exhibitors from 25 different countries and 68 speakers. The 2016 edition saw a big increase, attracting 2,000+ visitors, 120+ international companies exhibiting and 75 speakers with 4,000 visitors in 2017. 2019 expects more than 3000 visitors from the Unmanned and Robotics Industry (and over 23,000 including Infratech) from all over the world. TUS Expo Europe has an international profile and a focus on both the technology and the end-users. Cost (2019 event): Exhibition Pass: Free if registering before the deadline, €75 if on site. Full Conference Pass (€300,00) and a ticket for Live Demo Day (€15,00). To attend the Conference you can also buy a 1-Day Conference Pass (€180,00). 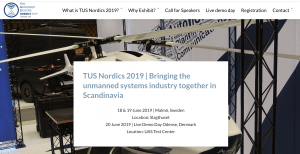 TUS Nordic (formerly Nordic UAS Event) is in its 6th year of operation and is expected to welcome over a 1000 visitors from different industry sectors. Focusing on the applications as well as the technology of Unmanned Systems, it creates a forum where all stakeholders in the Unmanned Systems industry gather under one roof to conduct business and enhance industry knowledge. In particular, TUS Nordics adds value in terms of knowledge exchange and showcasing innovative technology and advanced Unmanned Systems. Exhibitors include organizations throughout the entire industry, from manufacturers to (parts) suppliers, inspection and services companies, system integrators, consulting firms, industry associations, government agencies, chambers of commerce, universities, resellers, R&D institutes, and more. It provides a complete Exhibition and Conference addressing Traffic Management, Inspection, Mapping & Surveillance, Security, Defense, and Energy. A Live Demo Day will take place on the 20th of June in Odense, Denmark and it will serve as a platform for exhibiting companies to demonstrate their unique products or concept models in the sky above the runway. Several state-of-the-art unmanned rotorcrafts, hybrids and fixed-wing aircraft, as well as detect and avoid systems will be on display and will be flying tempting maneuvers. The day also provides opportunities to present and network. UAS4RS 2016 Conference was a 2-day conference to stimulate collaboration between Australian academics, UAS users, and commercial operators specifically on UAS technology for remote sensing applications and information extraction. Strongly supported by a series of Australian academic research centers specialized in remote sensing and environmental researches, it focused on technologies and applications for remote sensing and information extraction. It featured 40+ key speakers and a series of thematic sessions, covering all aspects of the use of UAS and advanced miniature sensors to map and monitor environments: 3D mapping, new multispectral and hyperspectral sensors, thermal sensing, LiDAR instruments, data acquisition, sensor integration, sensor calibration, georeferencing, sensor fusion, processing workflows, data analysis, calibration/validation, field operations, regulations, derivation of land-cover information and biophysical parameters, feature extraction and more. Organized by event management company Expodience France, the Paris UAV Show will be the first commercial event dedicated to professional non-military and recreational UAVs held in Paris. It will feature an exhibition and a conference. Details of the program and guest speakers haven’t been released yet. The 3-day Roma Drone Expo & Show, with 70+ exhibitors, 150+ speakers and 8,000+ visitors, was one of the top drone events in Italy in 2015. This event, targeting both the professionals and the general public, ran in 2016 with the same format. Details of the 2018 event will be announced the end of January. In addition to a trade show, conferences, workshops and networking events it also featured the Italy Drone Film Festival. Roma Drone Campus is a new B2B event for drone companies and professionals operating in the Italian market. Over 80 classes, conference sessions, technical workshops spread on 8 conference rooms were attended by an audience of 800 professionals in 2017. The 2018 event will include special events such as land and water drones, and a series of business meetings with foreign investors, and a flight demo area. This three-day expo, presented by the Academy of Model Aeronautics, provides a world-class display of the latest and greatest products for the modeling enthusiast and fun activities the whole family can enjoy, including flying demonstrations, model rocket, and plane build-and-fly stations – as well as interactive displays, static model competitions and guest speakers. With 100+ exhibitors and expert modelers on hand, the expo will be entertaining for the novice and experienced modeler alike. The AMA Expo EAST (along with AMA Expo WEST) will be promoted throughout the radio-controlled modeling industry and through local media outlets in each event location. AMA is the largest U.S. organization dedicated to model aeronautics with 195,000+ members, organizing since 1998 a show offering the latest products in radio-controlled model aviation, demonstrations, interactive displays, flight demos, technical sessions to thousands of attendees. (5,000+ attendees in 2016, growing year on year). AMA Expo East is an event AMA took over from the Westchester Radio Aero Modelers (WRAM). Their “WRAM show” was one of the longest-running shows of its kind in the model aviation industry and ran for 48 years. While it’s not focused on drones and is more consumer than B2B-oriented, drones have been growing in popularity in the AMA show and there have been quite a few drone-related sessions and showcases in the latest editions. The programme of AMA Expo East 2019 is not available yet. The International Drone Expo (IDE), one of the top global commercial drone events, held every year in December in Los Angeles, expanded to Europe and Asia in 2017. February will see the IDE International Drone Expo within the Mobile World Congress in Barcelona, the world’s largest gathering for the mobile industry, organised by the GSMA, attracting 100.000+ mobile technology buyers, sellers and attendees. IDE Barcelona 2018 is organized by E.J. Krause & Associates, one of the largest privately held exhibition management companies in the world, in association with UAV DACH, ARPAS UK, and UAS Norway. It will showcase in the exhibition area a large number of drone manufacturers, battery companies, sensor technology for drones, camera companies, service providers and training companies. It will also feature a drone “flying cage” for drone demonstrations, and a high-level conference about the latest rules and regulations, in-depth challenges and solutions, case studies, as well as how drone technology can help facilitate business and improve bottom-line performance. The event aims, in particular, at exploring the relationship between drones and mobile, covering the needs of the drone industry for more connectivity, the market opportunities for UAV data and the integration of mobile connectivity technology directly into drones and UAV base stations. The U.T.SEC (Unmanned Technologies & Security) Expo & Conference, organized by NürnbergMesse in partnership with UAV DACH, is the world’s first trade fair devoted to drone technologies in the security industry. Drones offer possibilities for increasing security in the civil, industrial and state sectors, but the growing number of possible applications also raises new questions with regard to such aspects as factory and operational safety, no-fly zones, flight restricted zones, protection of the private sphere. These will be the topics discussed during this 2-day event which features an exhibition, and accompanying conference and technical sessions plus networking opportunities. Organizers expect 80+ exhibitors, among them manufacturers of unmanned aerial vehicles, land vehicles and watercraft, equipment such as video, thermal and IR cameras and radar systems, jamming equipment for drone defense, associations, public authorities and technical media providing information about legal and insurance questions. The U.T.SEC is aimed at trade visitors from the areas of public safety, rescue services, industry, the energy sector and forestry as well as industrial safety and plant protection. Drone-Days 2019 is the 5th edition of this European trade show devoted to civil drones and taking place in Belgium. This 3-day event, targeting both the general public and professionals, includes an exhibition area (29 + exhibitors) and a flight demo area. There is also a special networking area organized in collaboration with Enterprise Europe Brussels, a member of the Enterprise Europe network, with the purpose of providing networking and matchmaking between professionals and businesses in the civil drone sector across Europe. The event runs concurrently with Photo-Days, an important trade show for photography and videos, featuring leading firms such as Panasonic, Sony, Nikon, Canon, Fujifilm, Olympus, Ricoh, CEWE, and Mitsubishi. The entrance fee to Drone Days enables visitors to also visit Photo-Days. Dronitaly “Working with Drones” is the B2B fair dedicated to the supply chain of aerial, aquatic and terrestrial remote piloting systems and their professional applications. Now in its fifth edition, it has a qualified program of conferences and business workshops presenting an ideal opportunity to gather information and establish professional relationships with operators in the sector. DronItaly is probably the top drone event in Italy. 2018 saw over 30 Exhibiting companies, over 1,400 accredited operators, 21 conferences and seminars and over 700 participants in the hall. The 2016 event was moved from Milan to ModenaFiere, where it took place on over 10,000 square meters and back to Milan in 2018 where it resides for 2019. It featured events and activities both for professionals and for consumers in a rich programme with conferences and technical sessions, exhibition area, networking activities, FVP races and drone-building and testing areas. Now in its 6th year, MobileTECH has firmly established itself as one of the leading cross-industry technology events in New Zealand. MobileTECH 2019 brings together over 300 technology leaders, innovative developers, early adopters and the next generation of primary industry operators from throughout New Zealand and Australia. MobileTECH is an annual event showcasing the digital technologies transforming the agricultural, horticultural and forestry sectors. The event features an exhibition and a conference focused on emerging and innovative mobile technologies impacting New Zealand’s key primary industries (Agriculture, Horticulture and Forestry). The theme for 2019 is ‘Data With Purpose’. Remote sensors are in our fields, GPS units track our vehicles, UAVs and satellites provide imagery data and electronic tagging is optimises distribution. The primary sector now has more data points than can be comprehended and the demand is not just for technology, but for the right analysis and application. Supported by: Ministry of Economy, Trade and Industry(METI), Ministry of Land, Infrastructure, Transport and Tourism(MLIT), Ministry of Agriculture, Forestry and Fisheries(MAFF), Japan UAV Association (JUAV), Japan Drone Consortium and many others. Organizers: Japan UAS Industrial Development Association (JUIDA), Congress Corporation, Space Media Japan Co. Ltd.
Japan Drone, among the biggest commercial drone events in Japan, is a 3-day event organized by JUIDA (Japan UAS Industry Development Association), in partnership with Congress Corporation, a leading company in the convention industry in Japan. The list of supporting organizations includes Japan UAV Association (JUAV), Japan Drone Consortium and many more. Japan Drone has grown from 118 exhibitors from 8 countries, 8,000+ attendees, and 50+ speakers in 2016 to over 200 planned exhibitors and 15,000 attendees in 2019. It will feature a B2B international exhibition and a conference and sessions. Previous year’s editions also hosted a section for startups with networking opportunities, a demo area and side activities open to the general public. The full 2019 programme isn’t available yet. The FAA UAS Symposium 2019 is again held by the Federal Aviation Administration (FAA) in conjunction with AUVSI. This 3-day event, which was postponed in February due to a government shutdown, is a forum for the UAS industry and stakeholder community and in 2019 it focuses on UAS regulatory environment, UTM, industry partnerships as well as how to overcome technical challenges to safe UAS operations. Join 1,000+ attendees from all sectors as the FAA, industry, academia and other government agencies get down to business to discuss the latest topics related to the growing use of UAS and its integration into the national airspace. 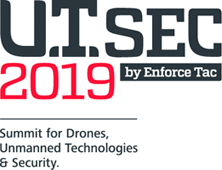 Supported by (2019 event): Intel, Alameda County Sheriff’s Dept., DHS, Zee Aero and more. If you missed the FAA UAS Symposium 2019 because of the Government shutdown, now is the chance to catch up at the ‘All About Autonomy’ Symposium, organized by AUVSI Silicon Valley. This 2-day event is a gathering for panels and events focusing on (as the name suggests) autonomy – on the ground and in the air. Join thought leaders from NASA, Intel, AUVSI & many other leading scientists, pilots, and politicians to study the landscape of autonomy. The Hiller Museum will be closed to the public to host this Symposium on March 1, 2019. Attendees will tour the museum & NASA Ames with special exhibitor vehicles. This 2-day event which runs biannually in Nantes, is one of the top 2018 events in France for the civil drone industry, attracting 4,000+ visitors in 2016, and covering drone applications and services in agriculture, architecture, planning, environment, tourism and heritage, networks (railways, electricity, gas etc), security/surveillance, emergency. Drone Experience targets a mixed professional and general public audience. To professionals, it offers a conference and technical sessions (20+ speakers of national relevance in 2015), an exhibition area spread on over 7,000 square meters (75+ exhibitors in 2016) and networking events for professionals. It also offered in 2016, activities aimed at the general public: training and technical sessions for hobbyists, a Drone Race Experience taking place in a hall of 4,500 m², a laboratory where you could build your own drone, the Drone Experience Film Festival and an International Photo Contest by Drone organized by Dronestagram and National Geographic. In 2016, it also offered a Robotic Show. The 2018 schedule is not yet available. Connect Expo is one of Australia’s top business technology events. It includes a large-scale trade show with themed technology zones and a multi-streamed conference program. The event, backed by the Victorian Government, attracted 5,000+ attendees in 2016. Drones played a major part in the 2016 show and were the topics of discussion in a number of panels. In 2017 the organizers have introduced the Drone Summit, a half-day conference with 4 sessions confirmed up to date. The event will run concurrently with 2 other tech events, the Digital Health Show and the DataCentre Show. Day Conf. from €260. Full Conf. pass from €475. Supporters (2019 event): National RPAS Associations and other supporting organisations. Commercial UAV Expo Europe focuses exclusively on a finite number of industries, making it an effective and efficient vehicle for owners and operators in those industries to access the most relevant education, contacts and products and services. Commercial UAV Expo Europe 2019 is the third European edition of the Commercial UAV Expo, top global B2B drone event held every year in Las Vegas and is organized by Diversified Communications, a leading international media company. The Commercial UAV Expo Europe, taking place again this year in the RAI, Amsterdam, includes a trade show, conferences and networking sessions, adopting the same format of the parent event in USA. In the conference, UAV industry experts will share key insights on implementing unmanned aerial systems with sessions on smart cities and urban air mobility, security and counter-drone technology and vertical industry deep-dives. Plenary sessions and panels will cover topics of interest to all end-users regardless of industry, while breakout sessions focus on UAV technology, applications and opportunities. The exhibition includes drone airframe manufacturers, component and sensor manufacturers, software developers and service companies. The Expo is also home to the Drone Hero Europe international competition for European based companies/organizations/individuals who have an innovative business case for drone technology. This contest is organized by the European UAV Knowledge Area (EUKA). Location: Las Vegas Convention Center, Las Vegas, Nevada, USA and the Jacob K. Javits Centre, New York City. Cost (2019 event): Exhibit pass+3 conference sessions starting from $185 / Exhibit: From $31 per sq. ft.
NAB Show is an annual, media focused trade show produced by the National Association of Broadcasters held on both East and West coast USA. With an attendance of 100,000 + visitors from 160 countries and 1,700+ exhibitors & $20.5 Billion in purchasing power, it’s the world’s largest event covering filmed entertainment and the development, management, and delivery of video content across all mediums. One of the special technology-focused areas of NAB Show in the past has been the Aerial Robotics and Drone Pavilion which launched in 2015. The Media Industry was an early adopter of drone technology and in 2019 it seems drones are now, more than any other industry, accepted as simply another tool in the film maker’s toolkit and exhibitors (like DJI) are in the Acquisition and Production section with camera and lenses. The Drone Show – International Drones Expo & Congress, organized by the event company eWorld in partnership with Aedron, the main drone industry association in Spain, is a 2-day event with 40+ speakers targeting both professionals and the general public. Running for the first time in 2017, this event featured a 2,500 square meter exhibition area (36+ exhibitors), a seminar program with national and international speakers experts, the European Drones Film Festival, a One to One Area for B2B networking, the Fly Zone Show by DDC, the Clinic Center with workshops to learn how to build and fix drones, and a startup competition. A similar programme will run for 2018. The seminar program includes 3 streams: TechCongress (mostly for manufacturers and software providers), Enterprise (for drone operators and service providers), Cinema (for drone filmmakers and photographers). The DroneShow is held concurrently with eShow, the largest Spanish e-commerce fair trade, attracting 150 exhibitors and 11,000+ visitors, and the organizers of the DroneShow expect 10,000+ visitors. Unmanned Systems Asia, co-located with Rotorcraft Asia – one of the biggest civil helicopter industry events in Asia. It last took place in 2017 and attracted over 3,000 visitors from 52 countries with 80 companies exhibiting. It showcased the future of drones across a vast spectrum of commercial and defense applications, showing cutting edge technologies and solutions in aerial, ground, surface and underwater systems. The event includes a conference forum focused on commercial aerial drone applications, an exhibition area, live demo zone, a startup-showcase and a VIP buyers programme. Sponsors (2019 event): (GOLD) Accenture, Altran, Schunk & KUKA among others. Global Robot Expo is a B2B international exhibition on innovation, robotics and related technologies, annually held in IFEMA, Madrid, Spain and is the most important robotic trade show in Europe. In its first edition in 2016, it attracted 10,000+ visitors to a 3-day event showcasing the current state of robotics in every single field, through an 8,000 square meters exhibition area (100+ exhibitors in 2016), conferences, technical sessions, workshops, demo areas etc. UTM / Urban Space, Security & Surveillance, Inspection & Monitoring and Geomatics. The main focus is to showcase common civil applications for UAS & Aerospace with the different players that are making it possible. GRX offers a direct connection with industry and business for platform manufacturers, components manufacturers, payload manufacturers and software. The Small Unmanned Systems Business Exposition is a San Francisco-based conference event focused on drones and drone applications. Running since 2013, it’s been created and managed by sUAS News, one of the most popular unmanned aviation news websites. The 2016 & 2017 editions were successful in terms of attendance and featured 40+ top-notch speakers spread along the 3 days of the event. The event will run in 2019 as confirmed by the organisers, but as of yet, the only available information is the date. The International Drone Expo in Japan, better known as IDE Tokyo, highlights not only on-trend technologies of the moment but also plenty of opportunities for R&D, financing, sustainability, and practical business solutions. According to METI (Ministry of Economy, Trade, and Industry), the Japanese UAV market is forecast to exceed 100 billion yen in 2030. The International Drone Expo, organized by EJK Japan and JUIDA (Japan UAS Industrial Development Association), is a 3-day event concurrent with Wireless Japan and Wireless IoT Expo, expected to attract in excess of 55,000 attendees. The 1st International Drone Expo in 2015 was Japan’s first major industry exhibition, and a huge success, attracting 9,300+ visitors and 50+ exhibitors. The 2016 & 2017 & 2018 events confirmed the popularity of this event, which targets both professionals and the general public, with a bigger exhibition area, a symposium and side events such as flight demos. Sponsors (2018 event): Applied Composites Engineering, ADS, HiTec, Houston Mechatronics,, IAI, ODU, Route 50, VOLZ Servos. In 4 days, the 2016 edition showcased 650+ exhibitors, representing 20 industries and 25 drone-related products and services, 200 top-notch speakers, and 335 educational sessions. The event attracted over 7,000 industry leaders and professionals from more than 55 countries. It has since grown and 2019 sees the event move to Chicago from Denver in 2018. The event featured a large exhibition area covering 370,000 sq. ft., and over 720 Exhibitors in 2018, a 4-day conference, a huge number of technical sessions, panels and workshops, networking events and a number of side activities. Information on the 2019 event is not available as of January 2019. Organizers expected 5,000 visitors for the first edition of Droni in Mostra in 2017. In 2017, this event featured a 1-day conference for industry operators, followed by 2 days of initiatives for the general public, including an exhibition, FPV races, demo flight zones and drone light shows. Announcements will be made soon re: the 2018 event. DroneShow is the main commercial drone event in South America and was the first one fully dedicated to the drone industry when it was launched in 2015. The 5th edition of DroneShow, to be held again in São Paulo from June 25 to 27, 2019 in conjunction with the 9th edition of the MundoGEO Connect event, the most important geospatial event in Latin America. The 2016 event attracted 55 exhibitors and 3,200 attendees from Brazil, Paraguay, Argentina, Chile, Peru, Venezuela, Colombia and Bolivia, and 120 speakers adding up to 102 hours of activities and it has grown from strength to strength with over 3,500 attendees in 2018. The 3-day event features an exhibition area, a main conference, seminars, courses and forums. DroneCon is a 3-day commercial drone event organized by United Drone Holdings, attracting 1000+ delegates from the South Africa drone industry. It features an expo and a conference with up to 55 speakers, focused on the current state of the industry in South Africa, and with sessions on different topics including regulations, and applications of drones in film & tv production, mining, cargo, agriculture etc. with live drone demonstrations and regulatory workshops. Drone Focus Conference 2019 is the 5th edition of this event which takes place in Fargo, North Dakota. Drone Focus offers two-days of content exploring the unmanned systems industry with experts, enthusiasts, and industry leaders. Learn from main stage content, interactive workshops, focused lunches, and more. A key feature of Drone Focus is the networking and connection opportunities and program of initiatives including a conference (over 35 speakers confirmed in 2018. Speakers not yet confirmed for 2019), an expo area, live flight events (with drone races and showcases of new consumer products), Part 107 training, interactive workshops, a competition for student pitches, a drone film festival and several structured networking opportunities like the Focused Lunches. In 2019, Drone Focus will build upon its foundation in the UAS space and expand to explore what it takes to build the infrastructure, software, systems, and resources for an autonomous nation. DronFest 2019 is the main UAV event in Czech Republic. It’s organized by Správa Informačních Technologií Města Plzě, a public body part of the local Town of Pilsen government. The event, which targets both professionals and the general public, will include an expo, a conference on UAV applications and flying regulation, networking activities, a drone coding/App competition, FPV races, and a drone photography contest for hobbyists as well as an exhibition for hobbyists. Organizers expect up to 4,000 visitors during this 2-day event. Cost (2019 event): Attendee ticket: $35 – $825. Super-savers available until Feb 15. Trade only. No under 18yrs. Exhibitor Costs: From $4,200. Produced by Diversified Communications, a leading international media company which also organizes the Las Vegas-based Commercial UAV Expo, SPAR 3D Expo & Conference is a 3-day top global event focused on 3D measurement and imaging technologies and is co-located with AEC Next Technology expo and conference. The 2018 event hosted 120 booths with best-in-class 3D sensing, processing and visualization solutions from leading vendors around the world and more than 1,000 3D innovators. 2018 saw 50+ exhibitors specialized in 3D modeling and mapping, and several technical sessions about the following topics: using sUAS with consumer cameras, new approaches to surveying using UAVs, 3D-enabled autonomy for scalable drone operations, and benchmarking UAVs. Cost (2019 event): Full event tickets: from €31 – €84. Children welcome if accompanied. Exhibitors: from €233 per sq. m.
This year Deutsche Messe restructured their event portfolio and CEBIT Hannover, a Hannover Messe spin-off, was canceled. CEBIT’s industry-related topics will now integrate into HANNOVER MESSE. HANNOVER MESSE is the world-renowned trade show brand synonymous with industrial innovation, key trends and business leads. The event has long made a name for itself as a global hotspot for Industry 4.0 technologies, hosting over 6,500 exhibitors and more than 220,000 visitors. Every year, HANNOVER MESSE shines its spotlight on a chosen Partner Country. In 2019, that country will be Sweden. Collaboration, innovation and digital transformation will be at the center of Sweden’s presence, with the country’s main objective to promote networking, trade and investment with partners from around the globe. Speaker list will be available in February 2019. This is a one-week residential course presented in English about photogrammetry and remote sensing techniques using UAV aerial images, which hosts sessions by top-level UAV professionals and researchers. Demand for Unmanned is being held as part of AIAA Aviation Forum, one of the most important B2B aviation and aerospace events in the industry, promoted by the American Institute Of Aeronautics And Astronautics. In its 2016 edition, Demand for Unmanned included sessions with 40+ top speakers mostly focusing on the integration of UAS into the U.S. airspace, autonomous flights technologies, and roadmaps to the future for UAS technology, operations and implementation. 2017 saw 2,800 participants from 40 countries. Similar numbers are expected for 2018. ICUAS (International Conference on Unmanned Aircraft Systems) is a 4-day event, running since 2008, hosting an exhibition area and a number of top-level, highly technical conferences and workshops. Organized by the ICUAS Association, it attracts participants from academia, industry, federal and state agencies, government, the private sector, users, practitioners and engineers. The sessions cover a wide spectrum focusing on civilian and public domain applications, technical requirements and standards, as well as legal, policy, privacy and ethical issues, and proceedings can be bought online on the ICUAS’s website once the event is over. The major themes of ICUAS’19 will be: design for trusted and assured autonomy, metrics for autonomy, and design for resilience. Eurosatory is among the top international Defence and Security industry trade shows in the world. It’s held every two years in Paris. It deals with commercial applications as well as defense applications. The 2016 edition featured the Unmanned Global Systems Show (UGS), an event covering the entire field of multi-environment unmanned systems and vehicles for Defence, Security and Civil applications. In 2018 there is again a drone conference. The Energy Drone Coalition Summit was the first event to focus exclusively on the business and technology of drones/UAVs for energy companies, operating in the oil & gas, power, mining and chemical markets. This 2-day event, supported by an advisory board strong of 13+ national experts, features an exhibition, a conference, workshops and networking initiatives for professional end-users of drone/UAV/UAS technologies at energy companies, developers of applications for drones, energy drone associations and user groups, regulators, as well as the service companies deploying drone technology on behalf of end users. Topics relate to implementation and scale, safety and risk mitigation, regulatory aspects, challenges and best practices for energy UAS operations. Details of the 2019 event have yet to be released as of January 2019. The UK Drone Show was one of Europe’s largest drone events, targeting a mix of drone professionals and general public. For this year’s event, the organizers announced “Drone Marketplace” – allowing low-cost access to exhibition for individuals, small businesses, and niche suppliers. This 3-day event featured a conference and technical sessions with 17+ expert guest speakers, a trade show with over 40+ exhibitors, large dedicated flight areas, and side activities such as an FPV racing competition, drone workshops, and live demonstration of prototypes. There is no information on an event for 2019 as of January 2019. Shenzhen International UAV Expo is the largest UAV industrial expo in China, and the 3rd edition which takes place in Shenzen, will attract again successful UAV companies thanks to its industrial policy providing great support for the development of the UAV industry. Co-organized by China UAV Industry Alliance and Shenzhen UAV Industry Association in 2017, this 3-day event was first launched in 2016 and expanded in 2017. The same format is expected to be adopted in 2018. In 2016 it featured an exhibition (120+ exhibitors in 2016, spread on 15,000 square meters), awards ceremonies (China Outstanding UAV Enterprises Top 20 Awards and Top 10 Drone Brands), and a series of conferences, technical sessions and panels with specific forums: Police Helicopter and UAV Innovation Application Forum, Chinese UAV Flight Control Technology Forum, China International UAV Forum and China Agricultural & Plant Protection UAV Forum. The event also features a flight demo area and the China Remote Piloted Vehicle Race Tour Grand Prix-International Championship. Global UTM Conference, organized by Global UTM Association, is focused on UAS Traffic Management. In 2017, it was an active one day event with 14+ international speakers, sessions and discussions. This year’s conference is a three-day event, titled “Connected Skies”. It is organized in collaboration with GSMA and will be hosted at Intel Portland’s campus. The goal of the conference is to create a bridge between the aviation and telecommunication industries. On day one, breakout sessions will present the trends in network solutions, regulation and UTM so that everyone has the necessary knowledge to contribute to the discussions the following days. On day 2 and 3, everybody will meet for forward-looking plenary sessions on topics such as “Remote IDs”, “LTE and 5G for drones”, “Deconfliction/Vehicle-to-Everything (V2X) communication” and much more. Cost (2017 event): Expo pass: from $0, One day pass: from $160, Two-day pass: from $240. RoboUniverse is a Conference and Expo dedicated to Robots, Drones and The Internet of Everything. It explores the incredible field of robotics, including their development, application, and use. Through a series of seminars, tutorials, and exhibits, attendees will gain insight into robotics and learn about the educational, business, and technical opportunities within this growing industry. Organizers expect the event to be of interest to a broad spectrum of professionals: from agriculture technology users, educators and software developers to investors, Government representatives, 3D printing, healthcare and manufacturing professionals. 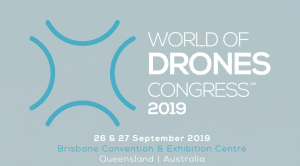 The World of Drones Congress (WoDC), organized by AEG Ogden, aims at providing an international forum for everyone concerned with drones, from businesses to governments, investors to enthusiasts, across the Asia Pacific region. In its very first year, 2017, the World of Drones Congress (WoDC) became the largest and most comprehensive drone conference ever held in Australasia/Oceania. WoDC 2018 returned to Brisbane with an expanded program and new interactive activities. 2018 also marked the inauguration of the National Defence Industries Drone Forum which joined the other forum to be held during the congress, the National Drone Safety Forum. WoDC is all about the business of drones and how drones can be applied to industry, business and the delivery of government services. Set in North Dakota, one of the US regions leading the way in the commercialization of the UAS industry, the UAS Summit and Expo is one of the oldest UAV events in the USA. 2019 marks the 13th edition of this 2-day content-packed event elevating commercialization and includes an exhibition and a conference (100+ industry experts in 2017) with presentations in the past from regulators, manufacturers, commercial pilots and others, in-depth analysis from the UAS Magazine editorial staff and panel-style project updates. Topics covered related to the current state of UAV industry in the US market: commercial UAV manufacturing and distribution, UAS technology offerings, regulatory updates, UTM, business case models, commercial uses, payload offerings and more. As of January 2019 there are no details of the event published other than the dates it will take place. Hosted in The Trabrennbahn Karlshorst (a trotting course), perfect for a drone racing event, where professional drones from different categories like surveillance, logistics, inspection and heavy loads competed with each other on a 42 km race track. Cost (2019 event): Attendees From $845 for 3xday. Group Discounts and student prices available. InterDrone (along with the Commercial UAV) is perhaps THE event to attend if you are a professional in the commercial drone industry, thanks to its numbers of professional attendance, the buzz generated and its overall quality. This 3-day event includes an exhibition, conferences, panels, sessions and over 110 workshops, demo flight areas, networking events and a wide range of side activities like ‘After Hours’, the Women in Drones Luncheon and the networking session. The International Drone Conference and Exposition, is where the commercial UAV industry comes together to connect with other drone pilots, service providers, UAS engineers and developers, UAV manufacturers, videographers and enterprise UAV end-users at the largest, commercially-dedicated show. 2018 saw 4,000+ attendees and 175+ exhibitors. The International Drone Expo (IDE) is another top event for professionals in the drone industry which takes place as part of the Mobile World Congress and is among the largest drone events in the world. And the numbers and quality of its past editions are indeed high. It has drawn in the past over 125 international exhibitors including several industry leaders such as DJI, Aerial Media Pros, MultiCopter Warehouse, Flir, Yuneec, and many more, and 4,500+ buyers from around the world and over 30,000 attendees. The two day event features an exhibit floor covering 9,200+ square meters, and displaying a variety of drones, parts, and services for commercial applications in cinematography, photography, real estate, emergency response, agriculture, oil & gas, mining, mapping and surveying, underwater exploration, and law enforcement, along with a host of other sectors for consumers. According to IDE, over 25% of global drone sales is to the telecom sector. It also hosts a business conference, technical sessions, networking events and many side activities including the IDE Drone Racing Cup, IDE Drone Pitchfest Competition 2016 and the International Drone Expo Video Showcase. 2020 event: confirmed for 2020! Cost (2017 event): Purchased on-site € 28, Pre-booked € 18. DRONE Berlin is an international forum exclusively focused on drone technology and innovation in the field of manufacturing, engineering and applications. The event will feature manufacturers and service providers from across the drone supply chain, providing an opportunity to source next-generation solutions for commercial and industrial UAVs. Highly-specialised engineers and procurement professionals attend DRONE Berlin to meet new and existing suppliers, invest in innovative products and solutions, network with industry peers and stay up-to-date with the latest technology of the drone industry. The exhibition runs concurrently with the expert-led conferences, delivering insight into key business and technical challenges while framing the commercial opportunities to reveal what is driving demand, shaping novel technologies and market trends. Now in its fourth year, it will take place again on May 26-27, 2020 in Berlin. Expodrónica, launched in 2015, and dedicated to the sector of drones for civilian uses, is the main commercial drone event in Spain, and one of the top commercial drone trade shows in Europe in terms of attendance both of exhibitors and audience, even if it mainly targets the Spanish market. This International trade show and conference, spread on an area of 10,000 square metres, attracted 65+ exhibitors, 20+ speakers and 6,000+ visitors in 2016. Expodrónica featured an exhibition, conferences and discussion panels, covering all aspects of the commercial drone industry and technologies, including air, ground and sea drones, and sectors such as mapping, agriculture, gas emission measurement, land and urban planning, civil engineering work and film industry. It also features a Startup competition, a demo flight zone, drone races featuring some of the best drone pilots of the world, and the Expodronica Drone Film Festival. Cost: Exhibitors on application. Visitors free entrance. Supported by (2018): Ministry of Entrepreneurship and Technology, Ministry of Digital Affairs, Kuyavian-pomeranian Voivodeship, The city of Toruń, Torun Agency for Regional Development, Nicolaus Copernicus University. DroneTech is one of the top commercial drone events in Poland and attracts representatives from over 60 international entities. This 2-day event, now in its 4th year, takes place in Poland’s most modern sports building in Toruń and features an exhibition, tailored B2B matchmaking events managed by Enterprise Europe Network and the Toruń Regional Development Agency, conferences focusing on Pro-community services; security, transportation, ecology and precision agriculture with lectures and discussion panels focusing on: legal regulations, the use of drones in different fields and their business potential. 2019 again features the DroneTech Race Cup: an indoor drone race championship. The UAV Show in Bordeaux, one of the top B2B drone events in France. This 2-day event featured in 2017 an exhibition, conference sessions with roundtable meetings, and 30+ speakers covering themes such as Applications for civilian drones; Standardization of national and international regulation; Development, international business, exportation; Drone technologies and R&D and women in media and drones. The event also included a delegation from Japan. The UAV Show also offered technical workshops, business meetings and networking events, and an outdoor drone flight test area to present drones in real life conditions. Judging of Festival Cinédrones also took place during the UAV show and winners were announced at the event. UAV Show will take place again in 2020 to celebrate its 10th Anniversary. Interaerial Solutions is a 3-day event organized as part of INTERGEO which is the world’s leading conference trade fair for geo-information and land management. and supported by UAV DACH. Following on from the flight zone at INTERGEO 2014 in Berlin, Interaerial Solutions was first launched in 2015 with some success (80 exhibitors and approximately 3,200 visitors) which made this event one of the biggest commercial drone events in Europe. In 2017 the event in Berlin became a full event around the drone industry (even if was still held as part of INTERGEO), and expanded its success, attracting 18,000+ visitors, 1,400 conference participants and 130 speakers. Commercial UAV Expo is another top global B2B drone event, dedicated exclusively to commercial drones used for professional applications. It’s organized by Diversified Communications, a leading international media company which also organizes the 3D Spar Expo & Conference event. Launched in 2015, the Commercial UAV Expo, which includes a trade show, conferences and networking sessions, was lauded as a huge success: it attracted over 120 exhibitors from 14 countries, over 70 top-notch presenters in technical sessions, and 1,500 high-level professionals visiting from 30 countries. Numbers grew in 2016, confirming the primary importance of this event in the industry: 150+ exhibitors, on a floor space doubled in size, attracted 1,800+ visitors. 2017 Commercial UAV merge with Drone World Expo and grow further. During the conference, UAV industry experts share key insights on implementing unmanned aerial systems, including systems selection and integration, developing enterprise workflows, guidelines and policies, data management and integration, and legal, safety and regulatory considerations. Plenary sessions and panels cover topics of interest to all end-users regardless of industry, while breakout sessions focus on UAV technology, applications and opportunities in the following vertical markets: Surveying & Mapping; Civil Infrastructure; Mining; Construction; Process, Power & Utilities; Precision Agriculture; Law Enforcement, Security and Search & Rescue (SAR). The exhibition includes drone airframe manufacturers, component and sensor manufacturers, software developers and service companies. 2019 event: SAVE THE DATE! Unmanned Canada 2016 was the 13th Annual Conference organized by Unmanned Systems Canada, a leading industry organization in Canada. This event represents the top B2B event for the Canadian UAV industry and is an event of international relevance. After a highly successful, informative and well-attended UC18Vancouver, USC-STC is pleased to announce the dates for the Annual Unmanned Canada conference, #UC19Ottawa! Conference dates for UC19 are October 30th – November 1st, 2019. The Westin Ottawa will be hosting the event. A top B2B event for the drone industry, the London-based Commercial UAV Show – Europe is now in its 6th year. It is one of the largest dedicated UAV events outside of the United States. The 2016 event saw 200+ attendees to the conference, 80+ speakers, 110+ exhibitors, and 2,500+ visitors growing year on year. It’s a showcase event for commercial applications for UAVs covering agriculture, emergency services, mapping, GIS, aerial photography, aerial videography, aerial surveying, construction and more. As with other Commercial UAV Show events in US, Europe, Africa and Asia, London also includes a trade show, conferences and panels hosting world-renowned industry leaders and experts (with over 24 speakers secured to date for 2019), workshops and serious networking opportunities. The London event includes dedicated seminar theaters (such as ones on Mapping, Surveying and GIS, Blue Light and Emergency Services etc), areas for demos, a section dedicated to startups, a user and university pavilion, a photography workshop, video installations, and more. The EASA High-Level Conference was a 2-day conference mostly targeting European policymakers, and involving representatives from EASA, the European Commission, the European Union, the Polish government, scientific research centers, universities, and the drone industry worldwide. This conference served as a follow-up to the RPAS Conference which took place in March 2015, that too promoted by the European Commission. Participants revised conclusions from that conference and discussed the current drone situation. Legislative provisions and the growing industry in Poland and Europe as a whole were also topics of discussion. The National Drone Show, which was co-located with Government Video Expo in previous years, is this year a single day meet up in the Washington area outside of the Government Video Expo which takes place December 3 – 5, 2019. RoboUniverse is an interdisciplinary event crossing robotics, automation and drones, taking place annually in San Diego, Seoul, Tokio and Singapore. The event offers a conference, seminars, tutorials, and exhibits. The 2016 San Diego event features two tracks (out of four) fully dedicated to drones. Specific sessions and panels with 18+ speakers will offer an overview of the drone industry, and specific insights on drones and data, drone regulations, drones in logistics and investments in drones. Sponsors (2019 event): UFI Members & others. 3E will showcase intelligent hardware and service robot technology to establish an eco-system for life and entertainment. More than a hundred interactive experience events and technology summits will attract more than 10 thousand visitors from 16 countries with seminars, conferences and matchmaking running concurrently. Smart Mobile Terminal: Medical, Healthcare, Education, Sports used devices and products. Smart Automobile: Unmanned Automobile, Automatic Drive, Vehicle Electronic Products. I hope you enjoyed our list of the top commercial drone events for 2019. Now, just pick the best drone event for you and let us know if you find something that we’ve missed!